11.20am: A man is in a critical condition after his motorcycle exploded in a crash with a white ute. Eye witnesses rushed out of their homes and businesses after hearing the crash and found the man and his bike on fire. The bike landed on the footpath outside Acoustic Enterprises on Charles St.
Luckily, the manager had left four buckets of water near the front door of the shop the night before and which helped to extinguish the flames. Police are still investigating, but eye witnesses said cars often use the street to perform U-turns back onto Musgrave St.
For more details on the incident see tomorrow's Bulletin. 9.45am: A MAN in his late 30s has been taken to Rockhampton Hospital with serious burns, in a critical condition. 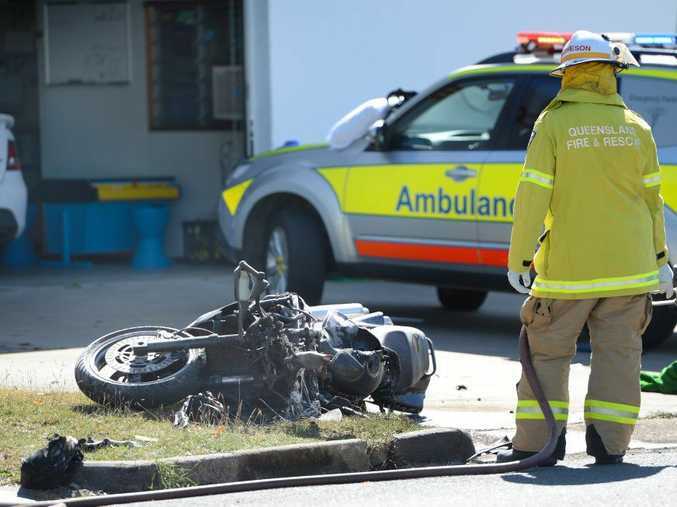 The man sustained burns and a leg injury from an accident between a motorbike and a car on the corner of Musgrave and Charles St this morning. 9.10am: EMERGENCY services at scene of major crash on corner of Musgrave and Charles Street. A male driver has received burns to 80 per cent of his body and sustained a leg injury, according to initial reports. The accident was between a vehicle and a motorcycle.